We lay down in the sand, gazing up in the sky as a cool gentle breeze blows on us. Above us were constellations of starts brightly shining. After coming from the busy city of Fes, we couldn’t hear anything apart from the faint drumming of the Berber tribe in our campsite. 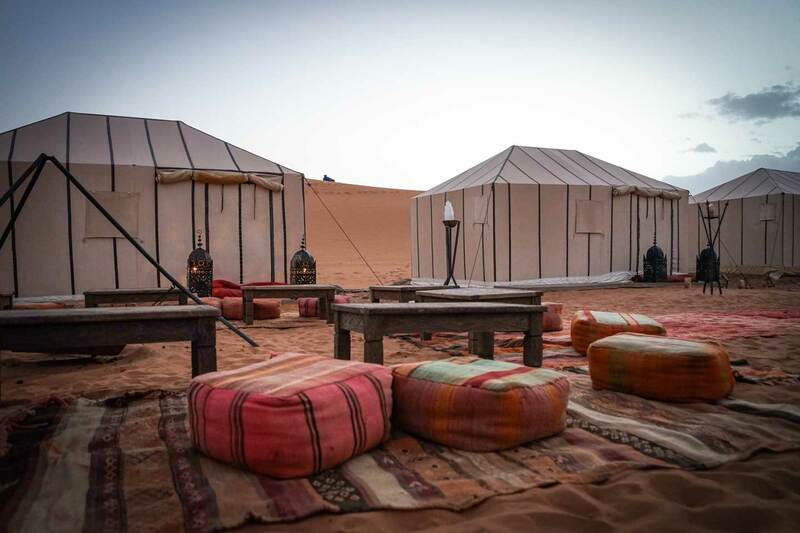 Our Sahara Desert experience was everything that I dreamed about as a child and more. Although I would have loved to spend at least two days in the desert, since we were on a time constraint, we had to settle for a night of sleeping in beautiful tents under a star-lit sky. We had booked a trip with Marrakesh Camel Trips who had arranged a 2 night-3 day trip taking us from Fes to Marrakesh. 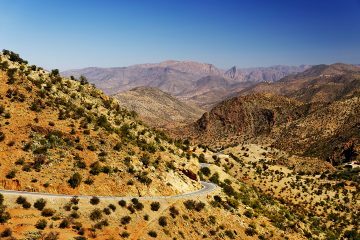 As we were heading towards Marrakesh after exploring the North of Morocco, doing this tour was a great way to see the famous sights along the way. 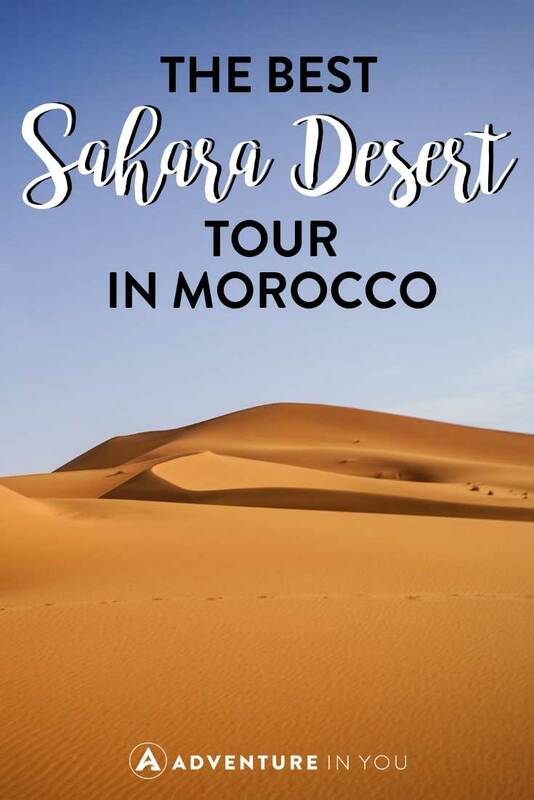 Not only were we able to spend the night in the Sahara Desert, we also got local insight thanks to the knowledgeable information that our guide happily shared with us along the way. 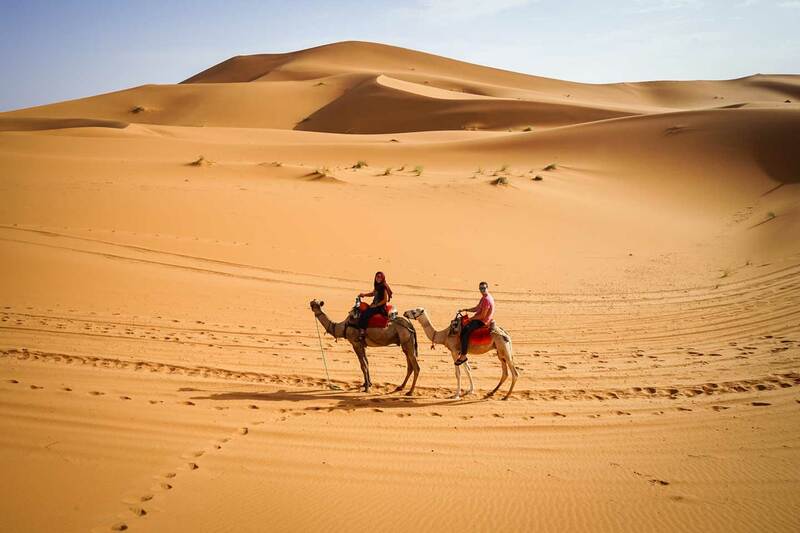 Marrakesh Camel Trips is a locally owned company who run desert tours all over Morocco. 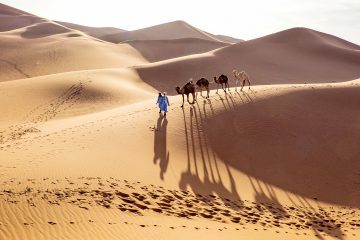 We decided to book our trip with Marrakesh Camel Trips as we found them to be very responsive over email. 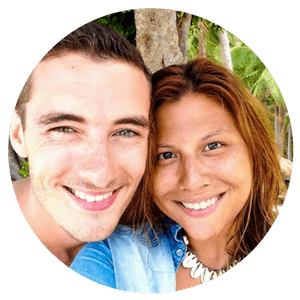 We inquired about different itineraries and they were willing to customize and help us come up with a trip that suited our tight travel schedule. The owner Brahim is very friendly and accommodating and their guides are all highly organized and helpful throughout the entire trip. The only thing we had to pay for was our lunch meals, water, tips, and any other extra beverages. Please note that Morocco is a Muslim country so drinking beer or wine is not as common. We were promptly picked up from our riad in Fes at 8 in the morning, ready to start our day. At any time during the trip, we were free to stop to take photos of the stunning sights we would see along the way which was a huge plus for us. We had debated whether we should ride the bus down or even rent our own car but due to the time constraint, availing of a tour and not having to worry about all the details made more sense for us. 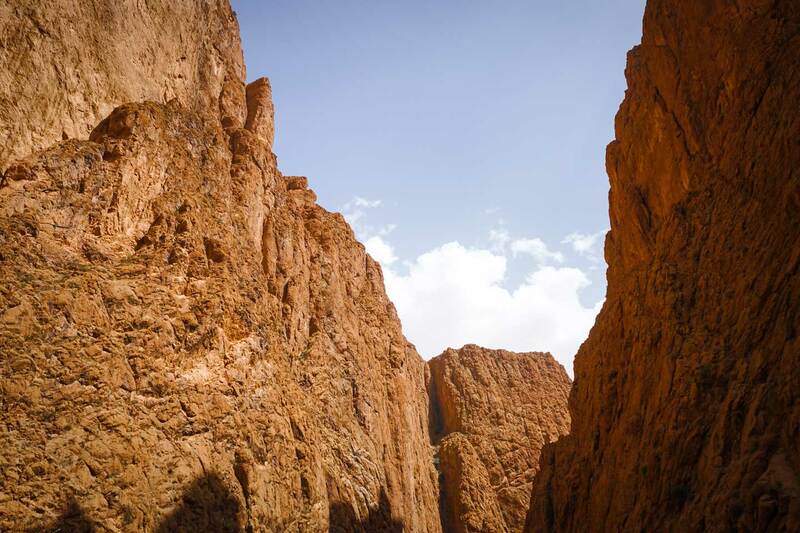 During this trip, we drove through the Tizi Ntalghamt pass along the Ziz gorge. We also stopped by a national park where we saw some wild monkeys who were cheekily being fed by the locals who were driving by. To be perfectly honest, it took me by surprise to see how vast and barren the lands were. I knew we were driving to reach the desert but the scale of its “emptiness” was something that genuinely surprised me. Every now and then, we would drive by a small town or village which was located in the middle of nowhere with small clusters of shops and restaurants. 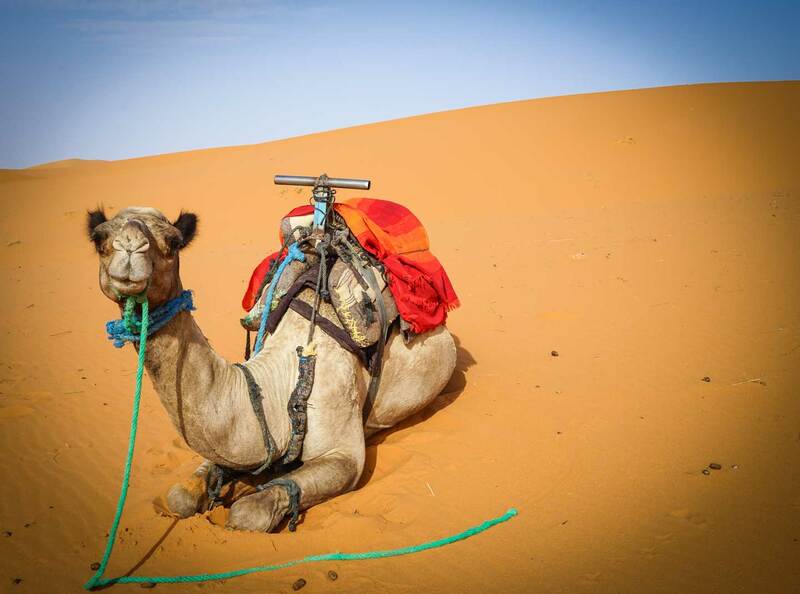 As soon as we arrived in the Merzouga Desert, our excitement started bubbling. We had been sitting in the car for quite some time and although the scenes were amazing, we were eager to see the desert landscape. We quickly met the owner of Marrakesh Camel Trips, Brahim who bid us a fun night in the desert. Tom and I immediately got on our camels, ready to head to the desert camp for the night. The camel ride was super fun and while it wasn’t the most comfortable, it was definitely a worthwhile experience. Our guide filled us in on his life living in the outskirts of the desert, how they care for their camels, and more. After a few minutes of riding, we started seeing the landscape around us change. Impressive sand dunes soon came to view and before we knew it, we were headed straight to the middle of the desert. After about an hour and a half of riding, we came to a clearing where our camel stopped. We got off our camels and started walking towards our campsite. Now, between the both of us, I am the planner and my partner Tom sorta just goes with the flow. I told him we were going to spend the night camping in the desert and that was all he knew. To his surprise, instead of a small stuffy tent, we had our own private luxury tent complete with a bed, bathroom, and dining hall. Our little campsite was like a desert oasis which had a dining tent, open-air seating areas, and a fire pit. The best part about it was that unlike other desert camps, we had no other camps around us which meant apart from the people in our camp, we were on our own. The campsite itself was beautiful and upon entering, we were warmly welcomed with mint tea and some light snacks. 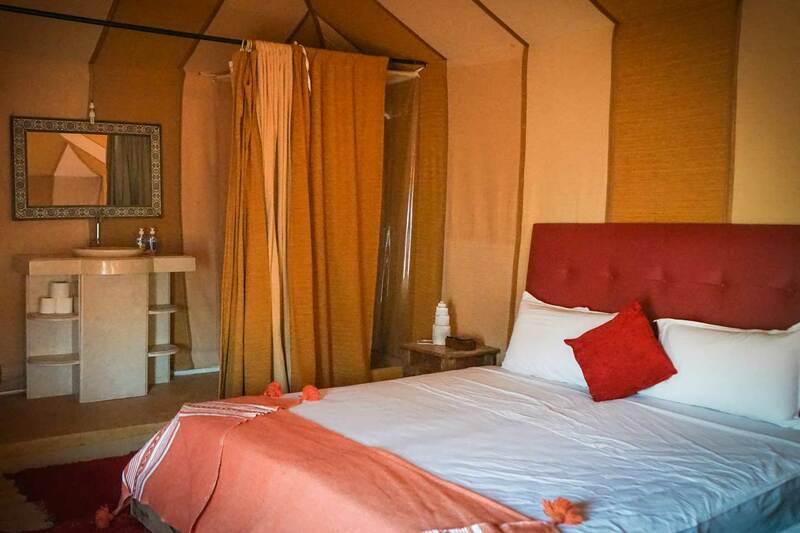 Upon entering our tent, Tom’s face dropped as he saw a full-sized bed, toilet, and shower (complete with hot and cold water). The look on his face alone was worth every penny! After quickly putting away our bags (which was brought in by an SUV), we rushed to climb the nearest sand dune to watch the sunset. Together, we sat on top of the dunes staring out at the sky as the sun went down. After the sun went down over the dunes, we wandered back to our camp where dinner was brewing. We entered the tent and was immediately surprised by the spread laid before us. Soup, appetizers, grilled meat, and a delicious fruit platter. We stuffed ourselves silly and sat around the fire pit, ready for the Beber drumming. Unfortunately, it was too windy to light a fire so we settled down to listen to our guides blissfully drumming away to the night. After a few hours, we quietly snuck away to one of the sand dunes to watch the stars go by. It was such a beautiful evening and will be an experience we will never forget. The next morning, we woke up bright an early to watch the sunrise. After we had climbed the nearest sand dune, it was already fairly bright outside so we thought we missed it. We sat around chatting and soon, we saw a big orange ball rise from the horizon. Suddenly, everyone’s mindless chatter hushed as we all transfixed on one of the most magnificent nature shows before us. After the sunrise, we had breakfast outdoors and began our camel ride back to Merzouga. We had a lot of ground to cover that day as there is nearly 561km between the two cities. Day two was spent on the car driving towards the Todgha Gorge. The car ride itself was shorter than the day before which was a nice break! 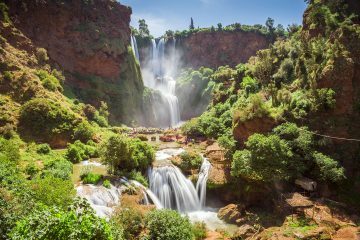 We also got time to stop in the gorges itself which is essentially a series of river canyons in the High Atlas Mountains. When we got to the Gorges, there were a lot of locals having picnics by the small water stream. It had a very lively atmosphere with lots of local drumming and singing, street vendors, and families all enjoying their surroundings. We went down from our car and walked along the gorge and took a few minutes to sit by the river which was nice. Shortly after, we were on our way to the Dades Valley. After a few more hours of vast landscapes and towns in the middle of nowhere, we arrived at our hotel which again, took us by surprise! The team at Marrakesh Camel Trips had really arranged fantastic accommodations for us throughout the trek and we were thoroughly impressed. Our hotel had a lovely pool overlooking the city alongside with a beautifully decorated room which had one of the most comfortable beds during our entire trip. After a day of sitting in the car, arriving in that hotel to be greeted with a cup of mint tea as we stared at the view was heaven! We woke up bright and early, ready for our trip back to Marrakesh. 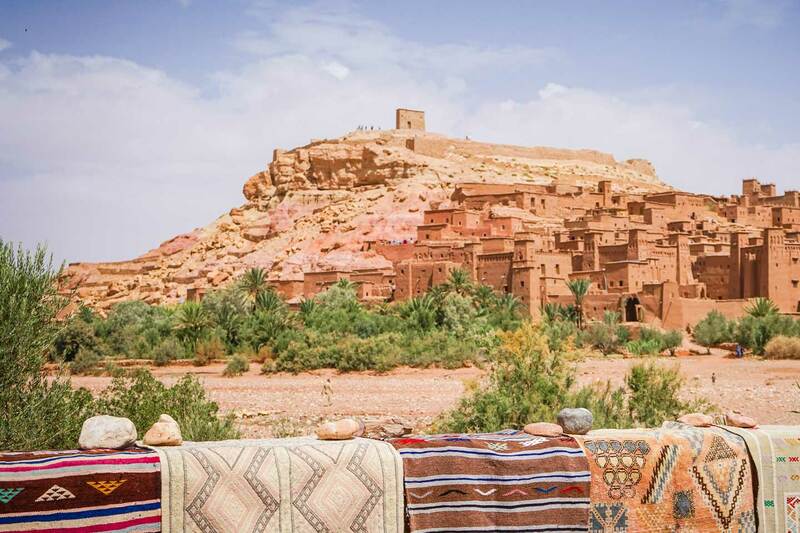 I was really excited about this day as we were going to drive through the famous Ait Ben Haddou Kasbah and through the beautiful but windy roads of the Atlas Mountains. 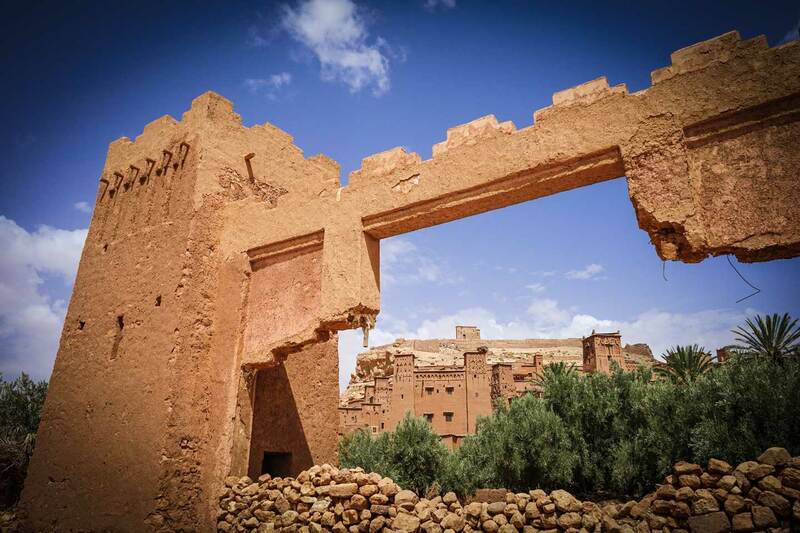 During our trip, we also stopped by Ouarzazate which is known as the Holywood of Africa. We personally didn’t spend a lot of time here because we found the entire place quite touristy. If you are however a big movie buff, it might be worth taking a look at the Holywood studio sets. After breezing past Ouarzazate, we drove towards Ait Ben Haddou. This popular village has been the setting of so many Holywood movies and series like Babel, Prince of Persia, and Game of Thrones. I was totally geeking out on this place as it had so many beautiful nooks and crannies. Our guide led us through the back of the kasbah as we started ascending towards the viewpoint at the top. There was some construction going on so some streets were closed during our time there. It was like a labyrinth of little doorways and houses with cute rooftops and although the place was very touristy, it was still worth exploring. Side Note: It is worth noting that along the way, we also stopped in an Argan Oil Cooperative and although the ladies there were lovely, I found the oil to be a bit overpriced. They were 100% original though which is better than those being sold in Marrakesh, however, I found the souks of Essaouira to sell the really good ones at a good price. After we left Ait Ben Haddou, we made our way through the High Atlas Mountains until we reached the bustling cityscape of Marrakesh. 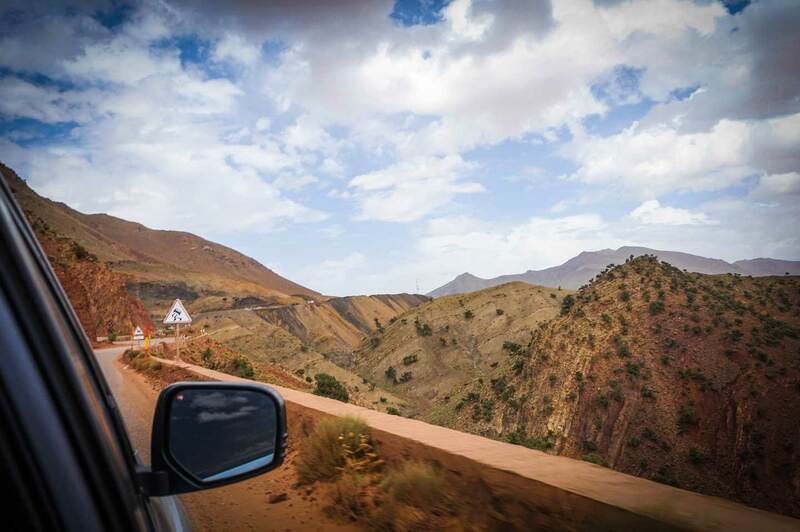 The drive through the Atlas Mountains was beautiful however there was some roadside construction along the way which added a few hours to our drive time. 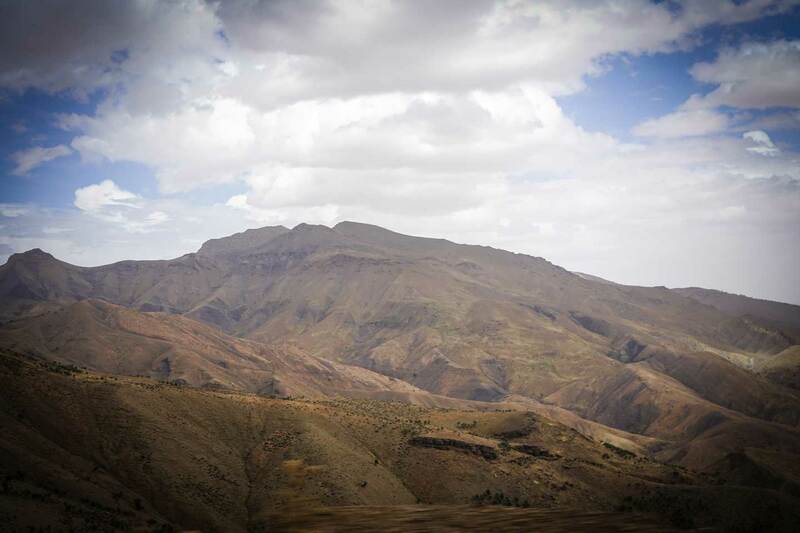 By the time we reached Marrakesh, we were tired but pumped from all the beautiful sights we saw along the way! 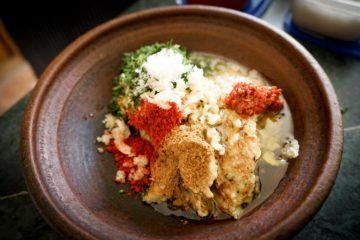 After a few days exploring the desert and its neighboring towns, we were eager to explore the city and even go on a couple of Moroccan cooking classes. It was an epic trip and definitely something I recommend doing, as taking a bus won’t allow you to stop in the many little villages and scenic points. 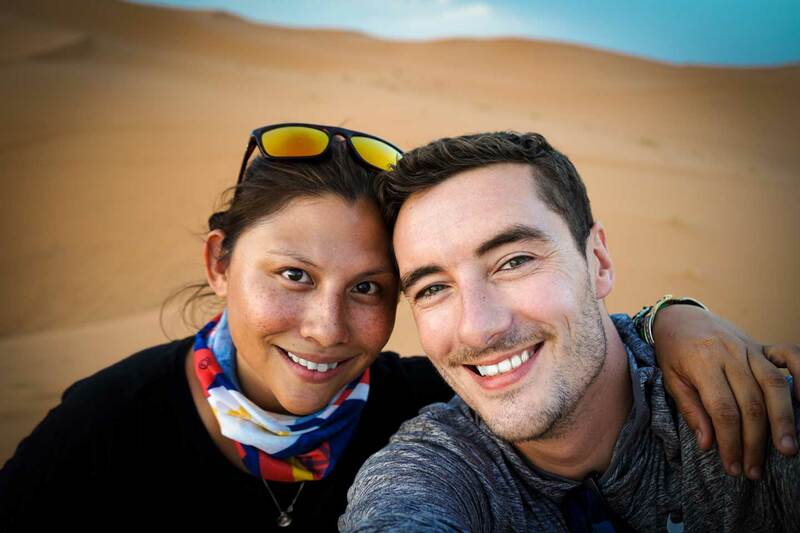 In a nutshell, I couldn’t have been happier with our Morocco desert tour experience. Our guide/driver was knowledgeable and shared loads of interesting facts about the country along the way. Having the freedom to stop wherever we wanted to was also a huge plus as we got to snap away loads of photos. Although some people do this route by renting a car, for us, because the driving time was so long, it was great to be able to relax in the back seat so we could enjoy the view. 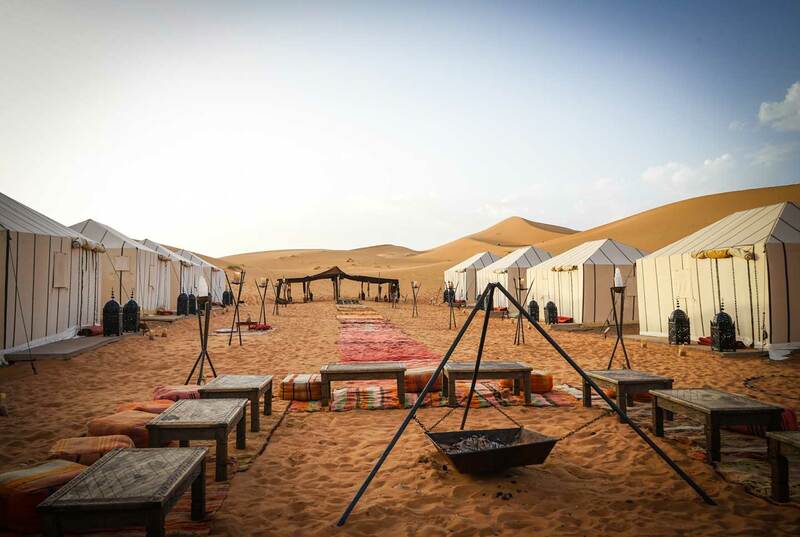 The desert camp itself blew us away and was more than what we had imagined. Overall, this experience is something I highly recommend doing if you’re planning on going to Morocco. 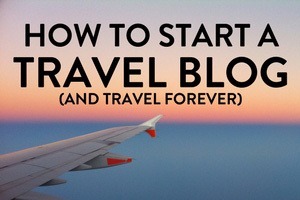 Interested to do this trip? You can check out their website and inquire! 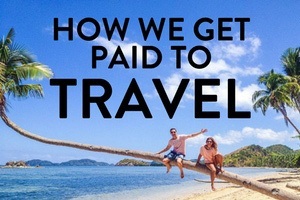 As mentioned, they are super responsive and can also customize and tailor trips for you. 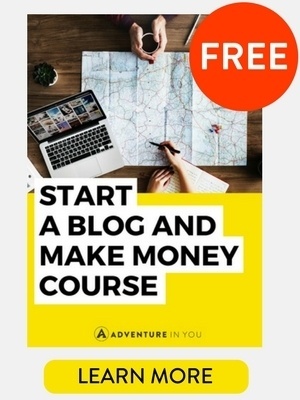 You can read their reviews here or browse through their packages below.